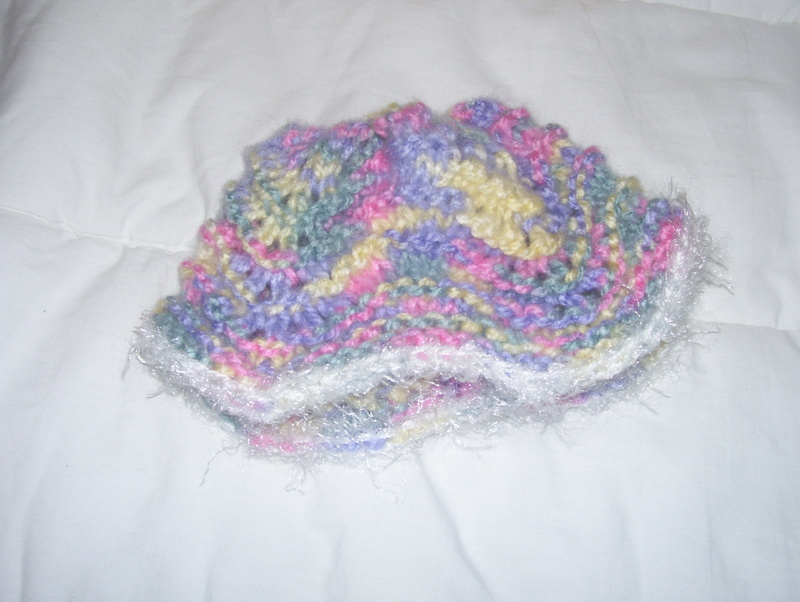 Baby hat #5, feather and fan one. Pattern’s here. 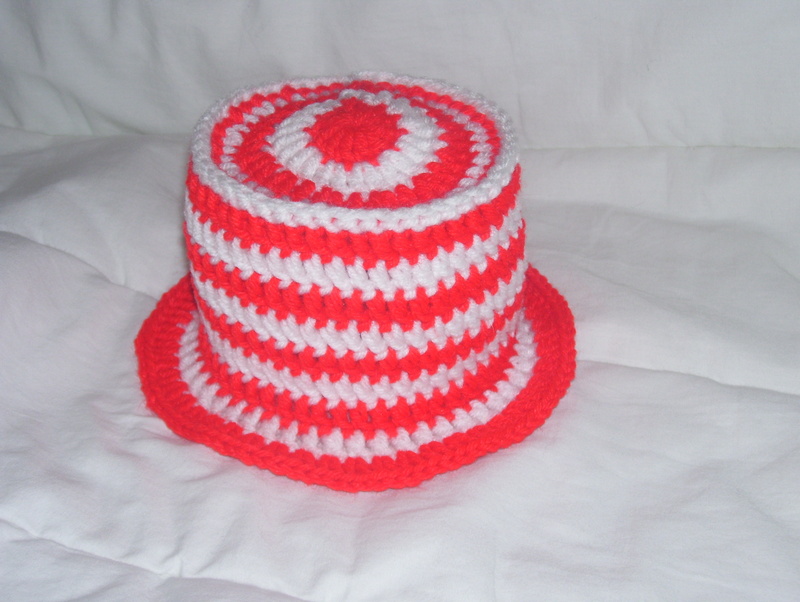 #14 here is the Cat in the Hat style top hat. Cute huh? Thanks again for the idea, friend. Spent about a half an hour at Joann’s looking at buttons before deciding on these adorable flowery ones. I figure if this baby’s not a girl, there’s a charity auction thing in the spring at hubby’s work and I can always donate it. I’m going to use the rest of the green and pink yarn to knit up some booties, perhaps these, and a hat, for which I’m starting a garter stitch version of this. All Rav links, by the way. Also finished up my top down version of the feather and fan cap, and frankly, it’s not adorable. Hubby liked it, so that’s odd, but I think maybe he just likes the fun fur/eyelash yarn I bordered it with. This was fraught with problems. I started off with increasing enough to have the correct number on each needle for the feather and fan pattern, but when I started in on the pattern, it was situated such that it made 4 little bumps/nipply things on the top of the hat. It looked horrible. I thought, maybe if I shift the pattern it’ll do better. That sort of worked, now there’s only small bumps. I got to where I was almost out of yarn, so I checked my amount, and figured I had enough to do one more row and then bind off. Which, if it had worked, would have been great, since it allowed me to do a couple rounds in garter st and then bind off on the knit row. Alas, it was not to be. I ran out of yarn midway through the 3rd needle. So, I went stash-diving and came up with some shiny white dk yarn and some very fluffy white eyelash yarn that I held together for the bind off row. Somehow, now the hat totally flairs at the bottom. Makes it look like a bucket hat. I don’t know if I loosened way up at the bottom, or if perhaps I should have kept some of the decreases in or what. I will not be posting this pattern, as I certainly don’t want to repeat it. 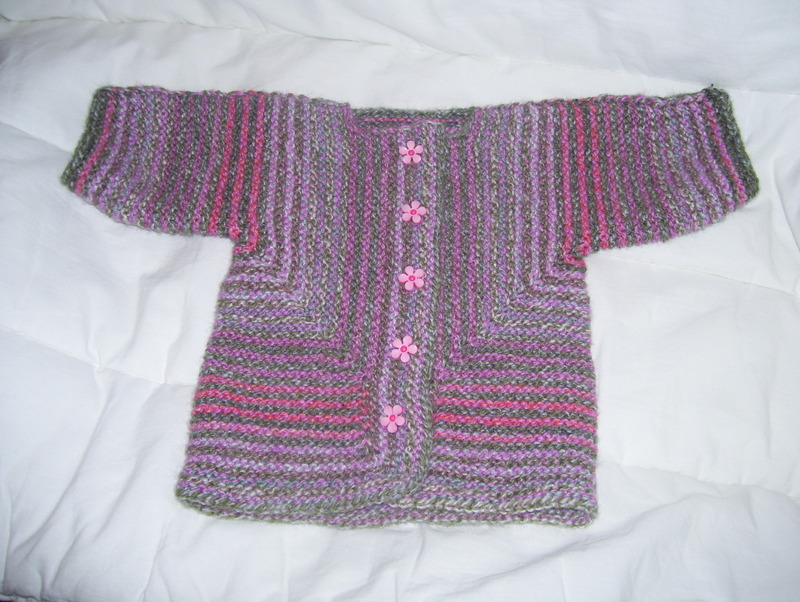 I’d post it on Rav as an ugh, but I don’t want to send bad vibes to whatever baby is going to wear it. 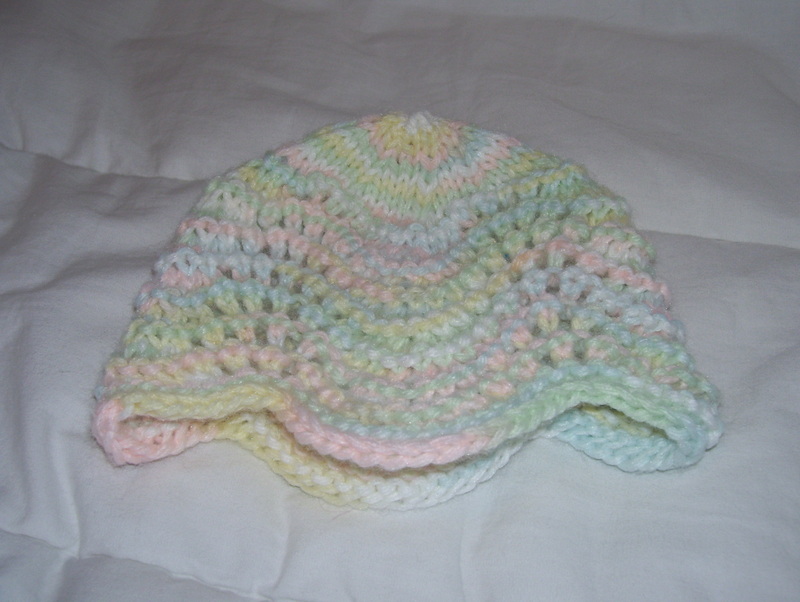 I did mention why I’m doing these baby hats, didn’t I? Go here and read if you’d like. Again, Rav link. There’s a few more things, but I’m going to save them for tomorrow. Cause, after all, tomorrow is another day. Thanks Scarlett.